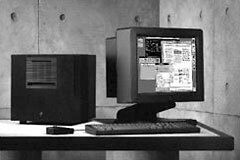 NeXT overhauled their entire line in Sept. 1990, introducing the NeXTcube as a more powerful replacment for the original Cube. At just $11,495, it offered Quadra 900 speed at about the same price as a Mac IIfx 4/160 with a 12" b&w screen. And the NeXTstation included more memory, a larger hard drive, a 17" b&w display, and ethernet (the IIfx still used LocalTalk). size (HxWxD): 12" x 12" x 12"
Commonly asked (by Mac users) questions about NextStep/OpenStep systems, Kevin Coffee. Best single-page resource I've seen about NeXT stuff. If you know of good NeXT pages I should link to, please . Thanks!